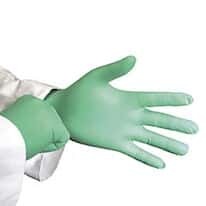 Disposable gloves provide convenience, comfort, and value, along with proven performance. When choosing the proper gloves for your application, make sure the gloves are compatible with the chemicals in your application, and review the ratings and details of the gloves. Remember to measure your hand circumference and correct glove length for the best fit.